My name is Abu Shabazz. I am certified as a Personal Trainer through Parrillo Performance, and ISSA, as well as CPR/AED Certified. I have been training both recreational and competitive clients for over 10 years. I am blessed to share my training passion with my clients to assist them in reaching their goals. I am a Golden Gloves winner and use the skills I developed as a boxer in my training programs, both with individual clients and boxing boot camps. I am an IFPA Pro bodybuilder, winning my first show in 2007, as well as my IFPA pro card that same year at the KC Southern Gold’s Classic. My personal experience as a competitor gives me the understanding of the training process to be successful in this sport. 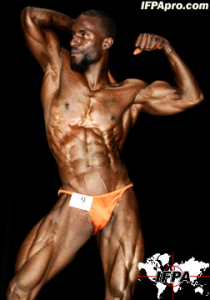 In 2012 three of my athletes obtained their pro cards in both body building and figure. Many of my clients have trained with me over a period of years, achieving goals and chasing new ones. I train both 1:1, as well as small group settings. Nutrition is a large part of my training program for all my clients. I specialize in customized workouts, both in the gym as well as the kitchen to meet the specific needs of my clients. My contest prep services include a 12 week plan of workouts, diet, and posing instruction, as well as back stage support and coaching on the day of show. My personal experience as a competitor gives me the understanding of the training process to be successful in the competitive sport of natural Bodybuilding. I have had success with both male and female clients competing in Bodybuilding, Figure and Bikini. My training philosophy is: “Training gives you a goal for your mind and body where exercise alone lacks direction and purpose." I wanted to start N-er-G to really show the magnificence of the inner particles of what it really takes to step on stage. N-er-G illustrates that in every action we are giving out all that we have put into our preparation to get ourselves to the stage, which is Our N-er-G: every ounce of sweat we leave on the equipment, every cardio session, every meal that we cook and every supplement that we take, tells a story of all the N-er-G we have sent forward to proudly stand on that stage. "N-er-G is not lost through exertion...that is when it is created"